Sen. Rubio to CNN’s Wolf Blitzer on a 2016 presidential run: I’ll have to make that decision next year. CNN’s Wolf Blitzer traveled to Capitol Hill to sit down with Sen. Marco Rubio (R-FL) for a wide-ranging political and foreign policy interview. Highlights are below and please visit http://archives.cnn.com/TRANSCRIPTS/ for a full program transcript. BLITZER: Do you trust Putin? RUBIO: No, of course not. I think Vladimir Putin’s goals are to reestablish Russia as a world power and kind of recapture some of what he feels they lost — lost after the fall of the Soviet Union. And so this customs league that they’re trying to set up as a part of that, his efforts to thwart us, whether it’s in Syria or Iran or right — even in Venezuela. You mentioned Venezuela. They’re flying Venezuelan — Russian-made jets are what’s flying over the skies in Venezuela to try to intimidate the population. He views anything that’s bad for the United States is good for him in this geopolitical contest. BLITZER: What about this interim deal with Iran right now, six months, they’re go to supposedly freeze their nuclear program. The U.S. eases up, together with the allies, some sanctions, hoping that afterward, there can be a real deal to eliminate Iran’s nuclear weapons capability. Are you with the president on that? RUBIO: I’m not, and I’ll tell you why. I would love nothing more than to wake up tomorrow morning to the news that the supreme leader in Iran has decided to forever abandon their nuclear ambitions. That’s not going to happen. For them, above everything else, other than a matter of geopolitical pride and influence, a nuclear weapons capability, they view, as the ultimate insurance policy against ever being overthrown. They believe it provides them immunity. BLITZER: Immigration. Now you were in the forefront, tried to get a deal. Got it through the Senate. Didn’t go anywhere in the House. Pathway to citizenship. Is it going to happen? BLITZER: Do you still support that, the pathway to citizenship? RUBIO: Look, I don’t think — we have 12 million people in this country that are here illegally. Some because they committed crimes or because they haven’t been here long enough are not able to stay. The others, if they can pass a background check and they can meet certain conditions — and there are going to have to be consequences and a long wait time for having violated the law. But eventually, I don’t think it is good for America to have millions of people here illegally, permanently who can never become Americans. So, I do think that has to be part of a total solution. BLITZER: Which you tried to do. RUBIO: Right. And I think at this point in time — it has always been hard to pass good policy in one comprehensive piece of legislation. I think the fact of the matter is the last two or three big comprehensive pieces of legislation that passed into law have proved disastrous. Dodd-Frank or Obamacare or what have you. And so I think a better approach is for us to begin to address is issue sequentially and individually. Let’s begin working on the things there is agreement and consensus on and use that to build momentum and the political space to finish the job. RUBIO: Yes. Nobody enlisted me for anything. I live in Florida; I live in a community surrounded by immigrants. I see the good, the bad, the ugly of immigration every single day. I know people who have become citizens and watch them weep at these ceremonies after years of trying to become an American. I’ve seen people that are here illegally to violate our laws and to take advantage of our social welfare system. I see people that are here illegally because children are desperate and hungry and they will do anything it takes to make children better off. So, I’ve seen every aspect of it. And what enlisted me to do something about it is not just that part about it, but it’s also the fact that we have a broken legal immigration system, which is damaging our country. We have a defacto amnesty. That’s what enlisted me to do it. But here is the predicament that we’re in. It requires the government to enforce the law so that we don’t have this problem again. And because this president has unilaterally decided which parts of the law he is going to enforce and which parts he will waive or ignore, he has made it difficult — not just on immigration but on anything that requires trust that the federal government will enforce the law. So, the single biggest impediment to immigration reform today is not Republicans. It’s Barack Obama. And it his spending the last couple of years ignoring the law, including his own signature law where he applies the parts he wants and ignores the parts he doesn’t like. BLITZER: Do you want to be president of the United States? RUBIO: — Wolf, you know, I don’t know, I’ll have to make that decision next year. It’s certainly something we’ll think about and talk about with our family and see if that’s a place that we think we can make a difference. I can tell you that I think America is at a real crossroads between another American century and a slow and steady decline. And I think that 21st century offers extraordinary opportunities for our people. But it’s going to require us to make some changes. And if I feel I can make a difference in that and from that office to lead us in that direction, that’s something I would have to strongly consider. But that probably won’t happen until later this year or early next year. BLITZER: It sounds like a yes to me. RUBIO: I don’t know. It sounds like I don’t know yet. It’s something we’re going to think about, as I’m sure others who have been approached about this and have been asked the same question have made that answer. I certainly feel compelled to continue to do something to help this country make the right choice on this crossroads that we’re in and, again, we’ll examine whether that’s the right way to do it. BLITZER: Jeb Bush gave me — not me, but he said the same thing yesterday. He said the end of this year he’ll decide. Here’s the question — and then I’m going to let you go. If he runs, will you run? RUBIO: Well, I haven’t even thought about it that way. The truth is, that I think if you’re going to run, it should have nothing to do with who else is in the race. It should have to do whether you think you’re prepared to do the job and you think you have a clear vision for where you want to take the country. I have tremendous admiration — we’re personal friends — for Governor Bush, worked with him when he was governor and I was in the state legislature. I think he would be a very formidable candidate and I’m sure he’s being — and I know he’s being encouraged by a lot of people to consider it. I’ve got my own calculation, of course, with a lot of decisions I want to make with my own life. So I — it sounds like we have the same time schedule, but I’m not quite sure how — you know, I haven’t given some — any thought to how that would play out. But my decision will be based on me, not what anybody else decides. BLITZER: And finally, if you run, could you beat Hillary Clinton? 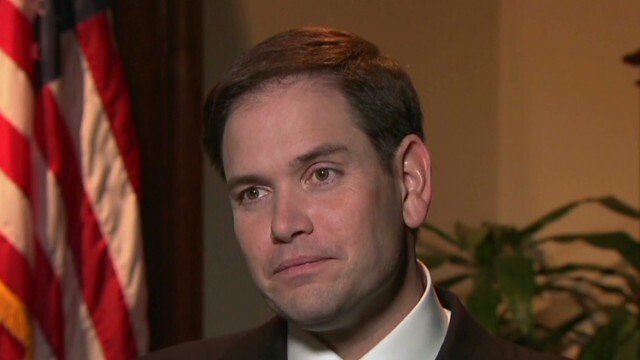 RUBIO: I — I think Hillary Clinton is going to struggle to win on multiple fronts. First, she’s going to be asked to account for her time as secretary of state. And I don’t think it’s the sterling success people think it is. Quite frankly, much of the foreign policy failures that we see in place today began when she ran the Department of State. I think she’s going to have to answer for Benghazi. I know people want to push that aside, but here’s a fact. The State Department knew that the risk level for that facility was extremely high. They should have either closed that facility or provided it adequate security. They did not, under her watch. She will have to answer for that. And here’s my final point. The 21st — we have to turn the page on the 20th century and move to the 21st. What ideas does she have to position America for 21st century leadership in a new economy, in a new world that’s changed so dramatically? The Democratic Party, including Secretary Clinton, all the policies they continue to spew out are old school, big-government policies that have never worked, work less now than ever before, and do nothing to position us for success. BLITZER: So the answer is you think you could beat her? RUBIO: I think a handful of people could beat her. I’m — I — again, she’s formidable because she’s experienced as a campaigner and in office. She’ll raise a lot of money. She may not even have a challenge in her primary. But at the end of the day, I think she’s going to have a lot to answer for. And I — I think the American people are willing — ready to turn the page and move forward to doing the things we need to do in this new century to have another American century.